Although some marketers have questioned the value of influencer marketing, it has become one of the most effective marketing tactics for many successful brands. Research from Sway Group reported marketers who implemented an influencer marketing campaign earned an average of $6.85 in media value for every $1 they spent on paid media. That’s not surprising when you consider consumers’ trust in brands has continued to decrease year-over-year, while their reliance upon and trust of word-of-mouth has increased. Recent Nielsen research found that word-of-mouth recommendations continue to outperform all other advertising types. Nielsen found 83% of Americans somewhat or completely trust endorsements and recommendations from people they know. This is followed by customer opinions posted online at 66%. One of the biggest challenges brands face with influencer marketing is calculating how much they should pay. Are you offering too little? Does the quote you got from an influencer seem a little high? Not to worry. Here are some tips to help you determine how much to pay influencers. Celebrity influencers get lots of press around their multi-million dollar earnings and the brands that are writing those checks. But are they worth it? The answer, which will vary from brand-to-brand, is “it depends”. First, you need to identify your brand’s goals and objectives for partnering with an influencer for a marketing campaign or content collaboration. Are you approaching it just as renting their audience? Or are you looking to form a longer-term relationship with the influencer, including co-creating content that lives on both of your platforms? Does the influencer have an engaged niche audience you haven’t been able to otherwise attract to your brand? 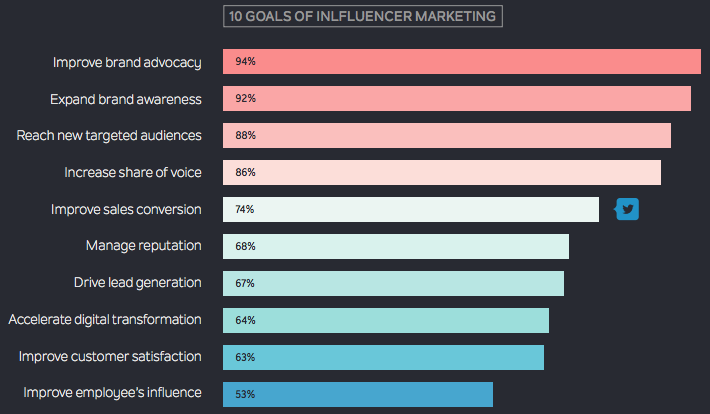 New influencer marketing research from Traackr found the top influencer marketing goals to be improving brand advocacy (94%), expanding brand awareness (92%), and reaching new target audiences. Lead generation was cited as a goal by significantly fewer marketers (67%), as many brands are still struggling with identifying how to work with influencers on collaborations that can directly drive sales. Think about what you are looking for the influencer’s audience to do as a result of the collaboration. Are you looking for a lift in brand awareness metrics? To gain social followers? Or are you looking for a direct sales opportunity as an outcome of the partnership? It’s important to understand both your and the influencer’s typical conversion rates so you can calculate your potential ROI on the collaboration. Without doing the math on what your likely outcomes are from your influencer marketing program, you can’t appropriately value the influencer’s contribution or set your budget for the effort. Similarly, think about what your brand would otherwise pay for creating the same type of content with the same ROI. If you would pay a video firm $10,000 to produce a 3-minute video for your website, keep that in mind as a value reference point when approaching an influencer for doing something similar. To Pay Influencers or Not to Pay? Some brands pride themselves on working only with unpaid brand advocates in their marketing efforts. But brand goodwill only goes so far. It’s entirely possible a brand fan will let you use some of their user-generated content without asking for a fee. But it’s unlikely you’ll be able to convince an influencer to create original content for your brand without some means of compensation. This is especially true in B2B marketing, where many of the top influencers are consultants who make their living from charging for their time and ideas. There always needs to be something in it for the influencer. This can be cash compensation, product gifting, promotion of their platforms by your brand, exclusive event access, or myriad other possibilities depending upon the influencers and their goals. It’s up to each marketer to weigh the pros and cons of payment for themselves and evaluate on a case-by-case basis. Many influencer marketplaces focus exclusively on celebrity-level influencers with more than 250,000 followers on their social media platform of choice. However, having an impressive amount of followers doesn’t necessarily equate to an influencer being able to drive their fans to action. Especially if many of those fans are bots or were possibly purchased. That’s why you need to consider more than potential reach to determine how to fairly compensate an influencer. Instead, you may want to focus on micro-influencers. These are people with significantly smaller social media followings, but may have more of an ability to influence purchases by their audience. Although the influencer with 250,000 followers may be able to boast of high impression numbers, they may not be able to say the same for their engagement rates. Many micro-influencers on the other hand, have high engagement rates and are frequently asked for their recommendations online. That means your one-time collaboration may reap benefits for the long-term if it is a successful collaboration on both parts. Celebrity-level influencers set their rates based on the access you’ll gain to their large follower base. The elite tier of such influencers will have an agent or agency representative you must work through to come to an agreement. Micro-influencers, on the other hand, may have a significantly lower cost-per-engagement, and be able to drive more qualified traffic to your website. 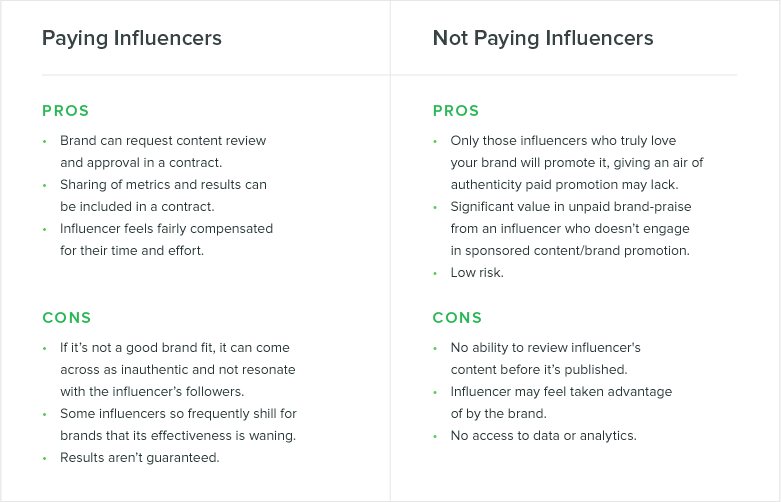 Just as there is no one-size-fits-all algorithm you can use to evaluate an influencer’s value to your brand as a collaborator, there’s no blueprint for payment either. However, there have been a few recent surveys that have looked into typical influencer content creation rates. The overall average price was $271 per post. The average price for micro-influencers with fewer than 1,000 followers was $83 per post. The average price for influencers with more than 100,000 followers was $763 per post. $500 per collaboration for blogs with 100,000 to 500,000 monthly impressions.. Remember, these numbers are not set in stone or the “official” pricing for all influencers. Some may charge less and others might charge significantly more. But you can use the figures above as a starting point. It can get discouraging to see the big numbers celebrity influencers are raking in for their brand endorsements, but that shouldn’t scare you off from pursuing a paid social media influencer marketing campaign. If you identify an influencer who is a good brand fit with a high level of audience engagement, it’s likely you can identify a mutually-beneficial collaboration you can both afford.